The neighbours all had green grass. Greener than green. You know? The kind that looks way better than yours from any particular vantage point. And it wasn’t that our grass was dead. It wasn’t crispy or prickly in the way of an unkept or abandoned garden. No, no, no. It was just that our grass was blue. Bluer than blue. With roots that went all the way down to Kentucky. So while other, normal kids had parents who listened to the kind of popular music that normal people called radio hits, and while other little girls had parents who, after pyjama parties, would flip normal pancakes and put on a normal eight track tape, or spin the vinyl of such familiar singers as James Taylor and The Eagles, or perhaps even something as foreign as Britain’s Genesis or Motown’s Jackson Five; my dad would sit at the kitchen table on a Sunday morning, in our six-room house with his second-hand guitar, and wake us up by belting out Grand Ole Opry tunes from the likes of Johnny Cash or Bill Monroe. GERALDINE MAC DONALD is a graduate of Queen’s University, a former registered nurse, a medical/scientific translator; a writer, published author, and mother of four. One favourite memory of childhood was when she discovered that town libraries were public and anyone could get a card! It was a life-changing day. Her second novel for young adults has recently been released to rave reviews. Besides translating medical stuff she writes fiction and creative non-fiction. Geraldine lives, works, and plays with her family in Kingston, Ontario. 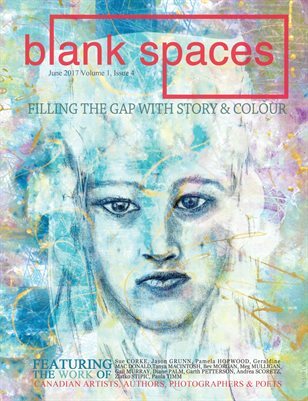 Volume 1, Issue 4 of Blank Spaces is a celebration of Canadian talent, featuring the work of artists—writers, painters, photographers, poets, etc.